The first time I heard a Florence and the Machine song, I was a sweaty, closeted teenager in a hot car, casually getting every cell in my body rearranged by a voice. It was the summer of 2008, I think. I was riding somewhere with my sister, no AC, and I put my hand out the passenger window, letting the air course through my fingers. “Kiss With a Fist” came on our local alt radio station in Minnesota, and I distinctly remember thinking, without a trace of irony, God I hope this band has a website. I didn’t know “Kiss With a Fist” was a sonic outlier on Florence and the Machine’s debut LP Lungs (2009), but it didn’t matter: its punk-lite conceit—a not-particularly-sensitive description of mutual abuse in a relationship by way of setting fires and smashing plates—still lassoed me in with its twisted sensibility. And, of course, there was that voice, too. That voice. It was layered under DIY, White Stripes-esque production but still gave off a subversive British cool, which seemed like the complete opposite of whatever I was giving off at the time. It was authentically cool—authentic, period. The voice belonged to a young English singer named Florence Welch, the band’s eponymous frontwoman, backed by keyboardist Isabella Summers and growing cohort of instrumentalists. Welch remains the face and unifying force of the band, and her music is sometimes described as “art rock,” an elastic term that loosely captures both the retro-rock stylings of more recent efforts and the baroque-pop of her first two albums. Her voice is a mix of Grace Slick, Siouxsie Sioux, and a little PJ Harvey, too—it has the capacity to be deeply mournful and thrillingly operatic. Stevie Nicks and Kate Bush are two explicit influences, and the songs on Lungs and Ceremonials (2012) are all rich tapestries of harps, organs, and general phantasmagoria: in the early hit “Dog Days Are Over,” soaring vocals were accompanied by claps, harp, and a stadium-ready bassline. On Lungs as a whole, the music runs a gamut of garage rock, soul, and a special Hot Topic magic that seemed perfectly timed both for the rise of YA paranormal romance fiction and the full maturation of my internal moodiness. 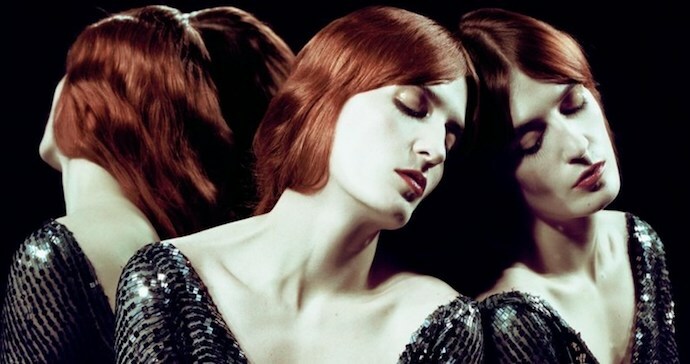 Ceremonials, its successor, takes this ancient-seeming intensity and expands upon it, using bombastic arrangements to serve longing and loneliness with a dose of mythic Arthurian realness. Liking Florence and the Machine’s music is pretty on-brand for me. As so many others, I’ve always been attracted to things that are over-the-top/gothic/weird/mysterious, etc. While my childhood and puberty years were mostly unremarkable—I’m a cis white dude from the Midwest—I think part of me was always overcompensating for that vanilla picture, trying to show how other I felt inside. I knew I was gay, but I didn’t know yet how to fold that fact into the larger scheme of my life; a consummate nerd, I drew wizards in notebook margins and read fantasy books and binged on my sisters’ Buffy DVD box sets. This was all done out of genuine interest, sure, but some reflection (and some therapy tbh) have given those tween years a kind of tragic patina: leaving middle school and junior high behind, I didn’t realize just how dissatisfied I was with reality or uncomfortable I was in my uniformly straight and cis surroundings. Toxic masculinity had already begun carving me out—or, rather, begun carving out a second person, a new person, out of the existing one. A man that would grow up without tears or dancing or political consciousness or big, all-consuming emotions. A man, a man, a man. So, I was pretty ripe for teen angst. The early singles from Lungs were released over the course of my sophomore year in high school, the album proper that summer. I would close the door to my parents’ tiny computer room with near masturbatory discretion and plug my headphones into their PC, rocking my head back and forth. Through tracks like “Drumming Song,” “Rabbit Heart (Raise It Up),” “Cosmic Love,” and “Blinding,” I entered into the knowledge of my own messiness: I wanted to run away, if only to rip off the trappings of a closeted existence. I wanted to bury myself in music and books and art and men. I wanted to live in the woods with wolves. I wanted to get lost. Access to a computer, aside from the obvious, had an added benefit: via YouTube and Myspace, I was able to encounter Welch visually—her willowy beauty, her occasional ferocity, her old soul. And while my stanning is rooted in Welch’s music, I still find myself gravitating simply to her, to her clothes and red hair and that regal face, pale and lean-cheeked—Vanessa Redgrave in Camelot, a Pre-Raphaelite painting come to life. It’s a face the culture has seen before, and that’s probably why it’s easier for me to find something compelling in its likeness. We’re both white, so already the sheer visual threshold to connection, to reflection, is lowered. And because so much of my understanding of art is an understanding of white art, she makes me think of other figures painted and sculpted and documented and described throughout history. She’s Emily Brontë on the moors; she’s Queen Mab on a seaside cliff. In fact, Welch once described her on-stage style as “The Lady of Shalott meets Ophelia . . . mixed with scary gothic bat lady.” This style has undergone an evolution in subsequent album cycles, exchanged for silvery-white suits and pink nightgowns, with one through-line: Welch continues to play each show barefoot, pivoting and skipping across the stage. Welch’s sophomore LP Ceremonials was released during my first months at college, in the fall of 2011. I had recently got drunk for the first time and texted a new crush, flirting with all the subtlety and grace of a hot meteor hurtling toward the earth. I remember watching the “Shake It Out” video in my dorm room alone, enthralled. “And I’ve been a fool and I’ve been blind,” Welch sings, “I can never leave the past behind.” Layers of tambourine and reverb help the track gallop heedlessly towards deliverance. “I like to keep my issues drawn, but it’s always darkest before the dawn.” It’s an especially extra track, and it made space for my extra-as-hell self to spin inside. I would listen to that song for years to come, walking home from the library in midwinter or trying to jog through the campus arboretum in spring. “Tonight I’m gonna bury that horse in the ground.” I listened to it on the way to a campus hook-up, and I listened to it again a year later, walking home after the same boy said I was getting fat. I listened to it for comfort; I listened to it for absolution. Welch’s 2015 album, How Big, How Blue, How Beautiful, served as a neat bookend to my college years. By then, I had taken time off from school and returned. I had chased after straight boys (it was a tiny liberal arts college, don’t @ me) and started eating my vegetables. HBHBHB marked a smooth change from the arguably one-note grandeur of Welch’s earlier records to something more sonically varied and lush with allusion: the contours of Welch’s poetic vision had never been so steeped in myth. The melodrama remained, but it was delivered with new gusto via heraldic horns and lush guitar backdrops. Full orchestral arrangements were balanced by softness: the harmonium on “St. Jude” that inhales and gasps, or Welch’s own whispery delivery in “Long & Lost.” As Welch was embracing sobriety and taking accountability in her own life, I tried to grow up in small, blink-and-you’ll-miss-it ways. Fast forward to summer 2018: in addition to releasing a book of original art and lyrics at the beginning of July, Welch put out her band’s fourth LP High as Hope on June 30th. The book, Useless Magic, is a unique document, an art student’s visual journal that also chronicles one woman’s struggle to find her voice. The mythic abstractions in her past song lyrics are traded for more direct soul-searching, as in poem “Song Continued”: “This new voice, this ‘me’ voice / Is it conversational / Confessional?” The new album, High as Hope, shows us the sonic manifestation of “this new voice,” with songs that are meditative in tone and memoir-like in subject. It also, occasionally, feels like a protest record—self-love and love for the larger body politic are braided together in songs like “June” and “100 Years.” The music sighs and still bites, but it’s ruminations feel like progress in a greater project of redemption. The spells don’t dazzle and redirect your attention away from Welch’s life; they turn inward instead, illuminating their caster. Being a queer consumer of culture, I wonder now: is there anything uniquely queer about escaping real life, if not redeeming it, with art? Maybe not, but Welch continues a long tradition of mystical women—many cis and straight, but not all—that have queered the pop culture space (in the more literal sense of the word) with their uniquely witchy powers. She has an ability to raise the listener up, bring our minds into spectacular realms, and then slam us back to earth, returning us to our bodies. Sometimes she uses heart-pounding bass and anthemic choruses; other times, a shiver of a cello and a soft syllable. I live in a different city now, try on different clothes and attitudes, but there’s no forgetting my haunted younger self, the person that needed that magic most of all. And despite the seeming disconnection of consuming music in the modern age, I still like to think that Welch came into my life and gave me, in the words of Kenneth Burke, “equipment for living.” An uncanny map to navigate those first years outside the closet, a silver key to get there. Ever-evolving, her music continues to show us all a way into our own messiness, absolve us of our mistakes, and give us something like an answer—a solution to the equation of being alive.